Want to book your car rental in Santorini? This is the right place! Search our booking engine for car rental in Santorini and book the best vehicle for your holidays on the island. Car rental Santorini will give you the opportunity to discover this island easily and conveniently. Plan your trip in the most convenient way for you and just where you want to go, at the most suitable time. View how our system works. Greeka.com offers car rental from Santorini Airport, Santorini port, Santorini center and many other locations. Greeka.com does its best to help you hire a car in Santorini. We cooperate with many Santorini car rental agencies and do our best to propose you the best prices available on the market. 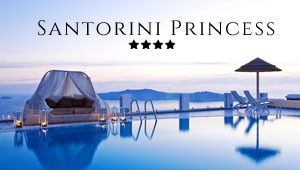 We cooperate with both local agencies but also with major car rental companies which have branches in Santorini. A lot of car rental agencies are spread all along Santorini. The Santorini car rental agencies we collaborate with are easy to access. They provide a wide range of conveniences to our clients. It will be possible for a car rental employee to deliver you the car at your hotel, the port or any other place. Furthermore, you can choose to pick up the car from a place of your preference, for example from the port or airport the day arrive. Moreover, they will be pleased to give you instructions on where to go and what to see in the region. They usually provide a map in all cars or you can ask for a GPS (upon request and extra charge). Discover some car rental compagnies in Santorini. This is a car-rental company that is based in Fira, Santorini. It provides a big variety of vehicles such as manual, automatic, open cars and mini buses. The company offers pick up and drop off at the main locations of the island, the airport and the ports, at hotels and other accommodations. The main office of this car hiring company is located in Oia, Santorini. Customers of Vazeos Car Moto Rental can choose from their large fleet of vehicles in all different categories – with manual or automatic transmission, open cars and minibuses, also luxury cars and motorcycles. Embarking a rented vehicle on a ferry is possible. Easy Rental company offers a variety of motor vehicles, including small cars, open cars, jeeps, Smarts, minibuses and also ATV’s. The company offers delivery and collection from any place in Santorini upon customer’s request, the ports and the airport. Their main offices are located in Perissa and Perivolos. This is a car hire agency, which has branch offices in Oia and Athinios port. They maintain a modern fleet of new cars presenting all different categories that one may need – economy, compact, motorcycles, scooters and others. Drossos Car rental also provides free delivery to many locations on the island. This car rental company has been on the market for over 25 years. It offers wide spectrum of cars, manual and automatic ones, motorbikes and other vehicles. Their car models are all new and all of them have Radio-CD and A/C. Axion Rent a car offers delivery to the port, to the airport or to any hotel on the island. Jimmys Rent a car is a vehicle rental company located in Imerovigli. Their fleet offers a variety of choices such as manual and automatic cars, ATVs and others. The company provides delivery to any place on the island. This car rental company was established in Fira, the capital of Santorini, more than 20 years ago. They have a large fleet consisting of Mini cars, manual and automatic cars and also mini buses. They offer delivery of their cars to any location on the island. This company is based in Kamari, very close to the airport, but it has also branch offices at the two ports of Santorini, Athinios and the old port. They also have rental stations in Imerovigli, Firostefani, Perrisa and Oia. Their fleet has manual and automatic cars varying in sizes and capacities. There are small and bigger manual cars, automatic Smart-type cars and automatic convertible cars, manual and automatic minibuses with seven or nine seats. Sunbird Rent a Car & Moto is a rental company operating in Imerovigli, Santorini Island. It has different categories of vehicles which include manual and automatic cars various in types and capacity. The company provides availability of economy, compact, open Smart cars, cabriolets with two or four seats, ATV’s and motorbikes. This company is based in Karterados village but it offers car rental services everywhere on the island. Its fleet has more than 70 models of cars in classified categories. Customers can rent manual, automatic, open cars and mini buses as well as off-race and city scooters that are available. Autocenter is a company situated in Kamari region very near to the airport. It offers 24-hours pick-up and delivery is possible from the two ports of the island Athinios and the Old port. There is also a branch office available at the airport. Its fleet has various models of vehicles such as city cars, coupe cars, intermediate cars and cars for seven or nine passengers. Cabriolets and jeeps, Mini and economy cars are also available. The company also offers exclusive cars for weddings or other events.